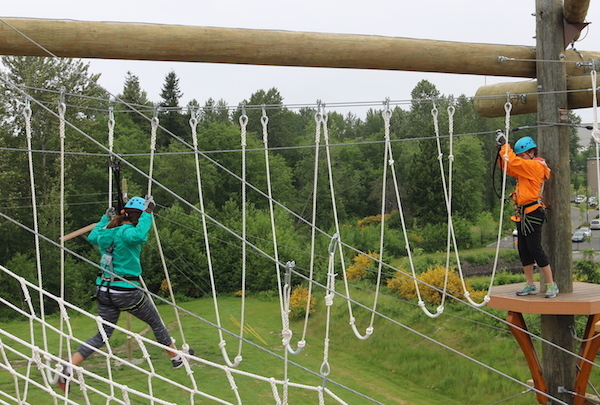 Use our 3 story challenge course and ziplines to get fit! Fall is a great time to be active outside! Why not make 1 hour of fitness at High Trek a regular part of your regimen? High Trek will provide staff to watch and play with your little ones while you go work out on the ropes course. We have a fitness regimen all ready for you to challenge yourself with. Our staff is available to provide suggestions on activities that can work on different muscle groups. Whether you want to work on balance, flexibility, core, or upper body, our course will provide the workout you are looking for. Bring a group of friends or come by yourself and meet new people. 1-hr. fitness climb = $20 ea. It is difficult to predict when business will be busy so we recommend using our online reservation feature to ensure that we reserve harnesses for you. Although we strongly encourage online reservations, if you want to call in the reservation, first create an account on our site by completing the online waiver form in the lower left hand corner of any screen (no scrolling necessary). Next, we ask that you call at least 48 hours before your preferred arrival time. Also, please understand that when it gets very busy in the office, we sometimes are unable to pick up the phone. If this happens, we suggest you leave a message and we will call you back to book your reservation as soon as we are able. We do have a “Rain Check” policy where reservations may be rescheduled outside of the 48 hour window due to inclement weather but the rescheduled time must take place within 2 weeks of the original time and is subject to availability. Please make sure you arrive ½ hour before your reservation time slot to allow time for check-in, gear-up, and flight school. Reservations are non-cancellable, non-refundable, non-reschedulable on the day of the reservation or thereafter.